Most menstrual cycles last between 24 - 35 days, with the average cycle lasting 28 days. For two to seven days of this cycle, the lining of the uterus wall is shed, resulting in bleeding, which is commonly known as a period. Women approaching menopause often notice increasing irregularities from the routine of this cycle, such as clots appearing in their periods, or periods occurring less frequently than normal. This can be unexpected or confusing; read on to learn more about why you may be experiencing these menstrual changes. The menstrual cycle is dictated by hormones, and menopause itself is defined as when periods stop occurring. Menopause is generally understood to have taken place after a woman has not had a period for a year. However, a woman's periods can occur sporadically leading up to when she gets her last period. As a woman approaches menopause, levels of hormones such as estrogen and progesterone change, and this can lead to menstrual irregularities. If bright or dark red clots appear in a woman's menstrual fluid, this may just be part of a heavy period. Due to the same hormonal imbalances that cause irregular periods, the lining of your uterus wall can become thicker as you approach menopause. During a regular period, natural anticoagulants prevent clotting from occurring. 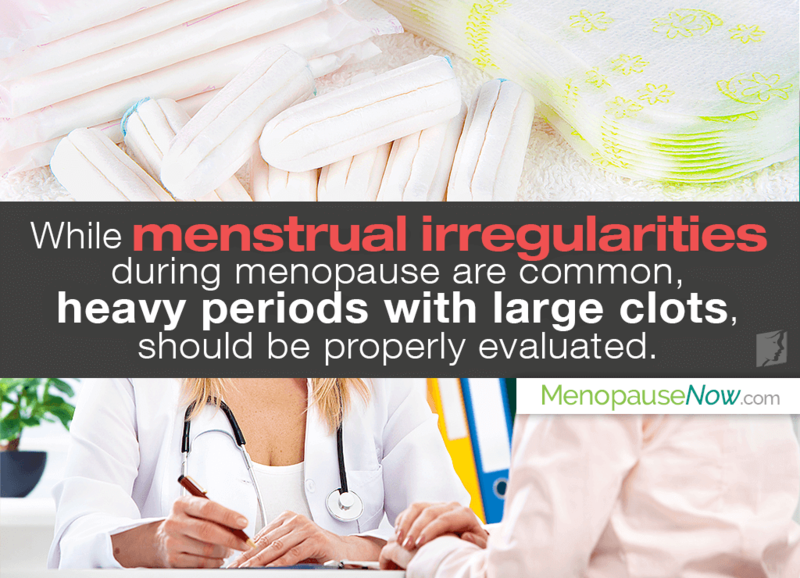 During menopause, however, the thicker uterus wall means there is more lining to be shed (resulting in a heavier period), so these anticoagulants do not have time to work properly, resulting in the appearance of clots. Menstrual irregularities are a common symptom of menopause, with approximately 90% of women between the ages of 44 - 55 experiencing them in some form. However, many other factors can impact a woman's menstrual cycle, such as a change in contraception. Other influential factors include stress and weight loss or gain. If you are concerned that you are affected by either of these issues, it is advisable to consult your doctor. Treatment is usually unnecessary for menstrual irregularities. It's a good idea to carry a supply of pads or tampons in your bag to prepare yourself for an unexpected or particularly heavy period. It can also be helpful to keep a calendar and record how long your menstrual cycles last and the specific days in which clots appear, so you have a record to show your doctor if you are concerned that your symptoms are indicative of more serious health issues. Irregular periods are common for women experiencing menopause, but they can be difficult to get used to, especially if a woman is accustomed to regular menstrual cycles. However, it is recommended that you see your doctor if your clots are large or extremely frequent, or if you have other concerning symptoms along with period clotting. Can Endometriosis Cause Irregular Periods? Peace of mind starts with having appropriate information. Read all about how to tell if it’s an irregular period or pregnancy here. When a woman reaches perimenopause, she will experience irregular periods. Read on to find out what causes heavy bleeding and how can you treat it. During perimenopause, although women will begin to experience irregular periods, it is still possible for them to ovulate and fall pregnant.